The Newman Educational Society, the Educational wing of the Diocese of Miao, organized an Inter-School Frs. 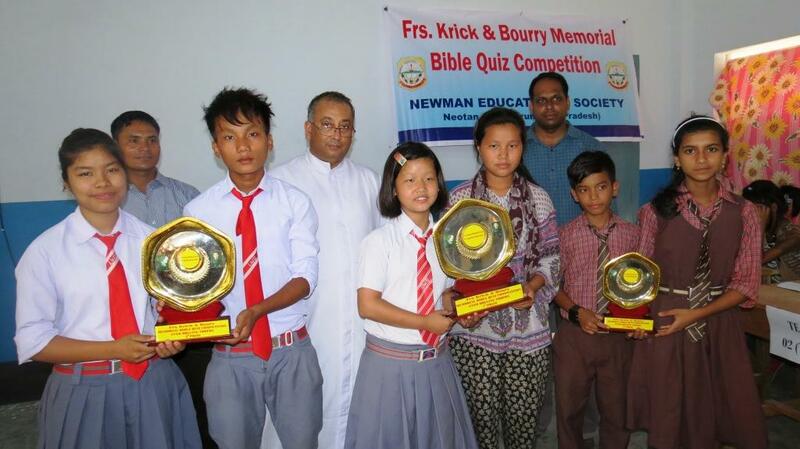 Krick and Bourry Memorial Bible Quiz Competition on 2nd August, 2014 at St. Mary’s School, Namsai. The Diocese of Miao has dedicated 2nd August as ‘Krick and Bourry Day’, the day when these two French Missionaries were martyered for their faith in Somme Village of Lohit District. The blood of these two Servants of God sowed the first seeds of Faith in this region. To acknowledge their Holiness and Example, the Diocese of Miao celebrates 2nd August as their Day every year. This year too it was celebrated with an Inter-School Bible Quiz, in which 16 schools participated. The Divince Word School, Roing won the First Prize, and Light of the World Shcool, Miao and Krick and Bourry Memorail School, Tezu bagged the second and third prize respectively.